William A. 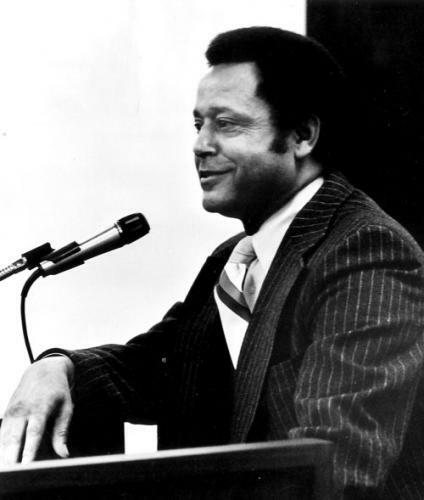 “Bill” Hilliard was the first black editor of the Portland Oregonian, the largest daily newspaper in Oregon, and the first black president of the American Society of Newspaper Editors. Hilliard, one of four children, was born May 28, 1927 in Chicago, Illinois, to Ruth and Felix Hilliard. His parents divorced when Hilliard was a small boy, and his mother re-married St. Clair Little. The new family moved to Oregon in 1936 so Ruth and St. Clair could work as a domestic and a laborer for a family in The Dalles. At age 11, Hilliard was turned down for a paper route with the Portland Oregonian because managers believed white subscribers wouldn’t want a black paper boy. In 1952, Hilliard graduated from Pacific University in Forest Grove, Oregon, with a degree in journalism. He started a weekly black newspaper, the Portland Challenger, while he worked as a redcap at Portland’s Union Station. Also in 1952, Hilliard became the first black employee in the Oregonian newsroom, where he landed a job as a “copy boy.” He earned promotions to sports clerk, sports reporter, and religion and general assignment reporter. In 1965 the Oregonianoffered him his first management job as assistant city editor. The paper then became the first on the West Coast to cover the national meetings of the National Association for the Advancement of Colored People (NAACP) and the National Urban League. Hilliard earned successive promotions to city editor, executive editor, and, in 1986, editor. Hilliard’s leadership brought change and growth to the Oregonian. The paper started suburban zoned coverage, boosted circulation, nearly tripled its ethnic minority staff, endorsed a Democratic presidential candidate for the first time, and became the first paper in the Pacific Northwest to hire a full-time foreign correspondent under his tenure. Hilliard traveled to colleges and newsrooms around the country to lecture about the benefits and importance of newsroom diversity. In 1992, Hilliard made the Oregonian the first mainstream newspaper to bar sports team names that are racial slurs. He implemented the policy after Native Americans protested the Atlanta (Georgia) Braves and Washington Redskins, who had played in the World Series and the Super Bowl. Five newspapers followed the Oregonian‘s lead. Hilliard’s tenure was not without its critics. In 1989, the Oregonian killed a story that suggested real estate agents weren’t necessary. The Wall Street Journal cited the incident in a report on newspapers bending to the concerns of advertisers. In 1992, the Oregonian declined to publish accusations of sexual harassment against then-U.S. Senator Robert Packwood before his re-election. Packwood won, and the allegations became public in the Washington Post a few weeks later. Hilliard soon admitted his paper should have been more aggressive. The American Society of Newspaper Editors (ASNE) elected Hilliard as its first black president in 1993. Hilliard retired from the Oregonian the following year, when his ASNE term ended. He returned to service to oversee an internal investigation at USA Today in 2002 after the newspaper discovered one of its star reporters had faked stories. Hilliard continues to be a lecturer and frequently-quoted advocate for newsroom diversity in retirement. Hilliard lives in Portland with his wife Dian. He has three children from a previous marriage. His honors include a Distinguished Service Award from the University of Oregon, and membership in the Oregon Newspaper Hall of Fame. William Hilliard died on January 16, 2017. He was 89. Author interview of William Hilliard, November 20, 2008; Chris Kent, “Oregonian Shuts Out Redskins, Braves,” American Journalism Review (April 1992); “William A. Hilliard,” Oregon Newspaper Hall of Fame, http://orenews.com/ (1998); Cheryl Reid, “A Newspaper Confesses: We Missed The Story,” American Journalism Review (January/February 1993); "William Hilliard, Former Oregonian Editory Dies at 89," The Seattle Times, https://www.seattletimes.com/nation-world/william-hilliard-former-oregonian-editor-dies-at-89/. Author interview of William Hilliard, November 20, 2008; Chris Kent, “Oregonian Shuts Out Redskins, Braves,” American Journalism Review (April 1992); “William A. Hilliard,” Oregon Newspaper Hall of Fame, http://orenews.com/ (1998); Cheryl Reid, “A Newspaper Confesses: We Missed The Story,” American Journalism Review (January/February 1993); “William Hilliard, Former Oregonian Editory Dies at 89,” The Seattle Times, https://www.seattletimes.com/nation-world/william-hilliard-former-oregonian-editor-dies-at-89/.